WASHINGTON, D.C. – Africa. The second largest and second most populous Continent in the world. Throughout history, many have been fascinated by the vast array of cultures and cultural practices of this great Continent. Hoping to share valuable insight, appreciation, and awareness of endangered African sign and symbols systems specifically Nigeria’s Uli practice, Ambassador Robin Renee Sanders publishes a new book, titled The Legendary Uli Women of Nigeria. 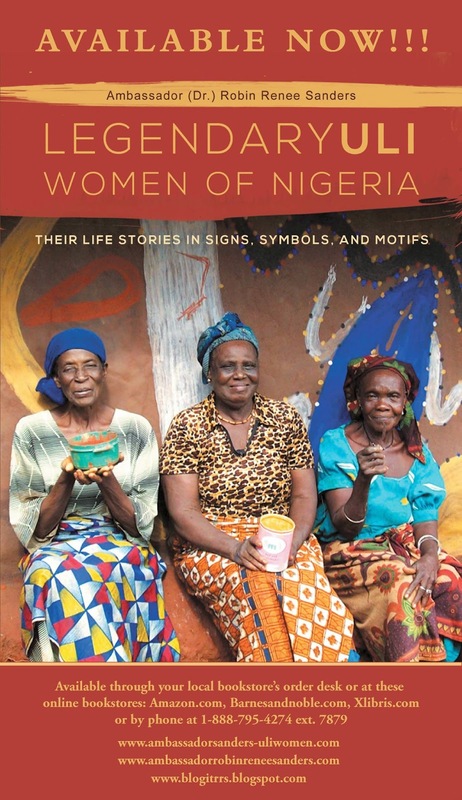 The book follows eight extraordinary Nigerian women in the December phase of their lives as they try to preserve the meanings of their endangered sign, symbol, and motif system called Uli. Uli is an acknowledgement of their Igbo history, culture and ancestors. Sanders agrees with others scholars who posit that non-text, non-oral forms of communication expressions such as Nigeria’s Uli, and other sign and symbol systems throughout the world, particularly in Africa, are just as important or “viable” as the written word and their meanings should be respected and preserved. Endangered cultural practices, like Uli, are just as important to protect as endangered languages as a symbiotic relationship exists between the two. The Legendary Uli Women of Nigeria is a uniquely groundbreaking work. It does not discuss, or view African signs and symbols as art or designs for contemporary clothes or jewelry, but stresses that they communicate. It also argues that world signs and symbol systems like Uli should be included as an area of study within the communication and information system academic field, which she recommends be called “communication expressions” since these systems do communicate the socio-historical aspects of a culture. Visit http://www.ambassadorrobinreneesanders.com for book excerpt. Panel Two – The Future of Africa: Key Sectoral Development & Recommendations: Power Africa, SMEs/Diaspora Development,& Agriculture: Mr. Rick Angiuoni, US EXIM Bank; Ngozi Bell – Small Business Administration (SBA); Her Excellency and Deputy Dean, Ambassador Faida Mitifu, DRC Ambassador to the U.S.; Her Excellency Liberata Rutageruka Mulamula, Tanzanian Ambassador to the U.S. Moderator: The Honorable Hank Cohen, CEO Cohen & Woods International, Inc. 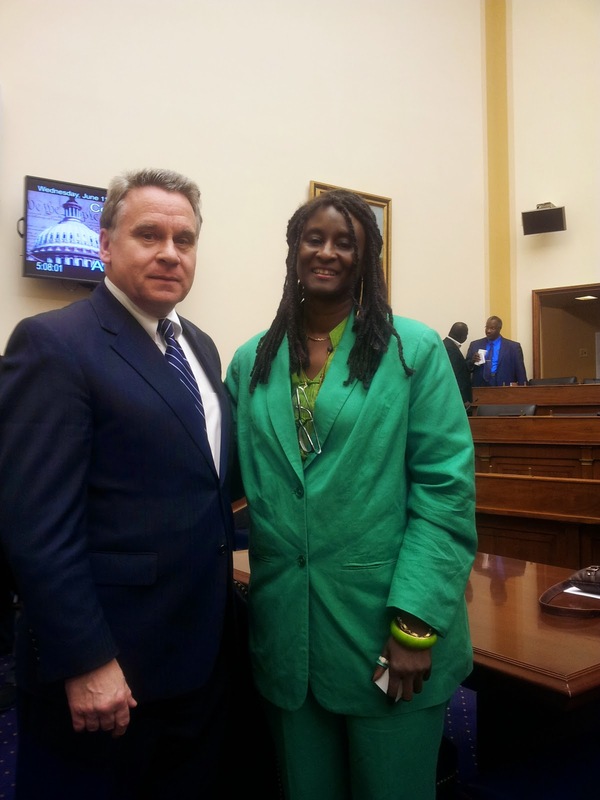 Following CEO-FEEEDS June 12, 2014, testimony to the U.S. House of Representative's Sub Committee on Africa, Global Health, Human Rights, and International Organization, the kidnappings and actions by Boko Haram have gone unabated and unchallenged, with 21 people killed in the country capital Abuja June 25; 60 people kidnapped (married women, girls, and boys) 100 miles from Borno's capital Maiduguri on June 24, June 23 the bombing of the polytechnic university in Kano, Nigeria's second largest city; and, in late May another 20 women kidnapped about 9 kilometers from Chibook -- the original site of the #bringbackourgirls tragedy. However, there is another issue which needs watching on top of the bombings, killings, and kidnappings in Chibook and through the Northeast. The so-called "vigilante groups" which have cropped up in Borno state villages over the last 6-8 months should begin to be on the human rights community watch list as well. Given the security vacuum in Nigeria's Northeast with security forces still very much on the defense in their failed efforts to date to combat Boko Haram, a number of village task force groups have cropped up in Borno State, which go by several names: civilian joint task force, vigilante, or village security or watch groups. Thus, on our collective human rights “watchlist” we should be paying more attention to what these groups are doing, how they are operating, or more importantly the potential for what they might morph into. Yes, we all understand why they have developed – they fulfill a serious security vacuum in their villages, and in the Northeast region. However, we have seen in several cases recently in Africa, how these groups, which start with the goal to seemingly filling a security vacuum, can quickly and easily become a security threat themselves. In the case of the Central Africa Republic (CAR) the emergence of the Christian-led anti-balaka groups, which initially came into being in response to the violent Muslim-led Seleka coup leaders have become in some cases just as violent and uncontrollable as the Seleka groups they wanted ousted from CAR. What is now going on in CAR is considered by some "pre-genocidal" as a combination of Christian-on-Muslim, and Muslim-on-Christian violence continues with little end in sight. In addition to CAR, another example as to why the Borno vigilante groups should be on our human rights "watch list" is the situation in Libya today. Some of the militia groups that the international community depended on so much in the Libyan crisis have clearly morphed into something else with little-to-no control over them by the weak Central Government in Tripoli. In many cases (not all), they have become fiefdoms unto themselves, controlling their respective enclaves by their rules. Militia elements were used to protect the US Consulate in Benghazi, Libya, and it remains unclear today whether any of them were involved in the attack on the Consulate. Thus, the Libyan militia have added another dimension to an existing stability crisis in the country as they see themselves as power units, sometimes becoming equally as lawless as the leaders or individual (as in the case of Lybia’s Muammar Gaddafi) that initially spurred their creation. Clearly, "vigilante" groups, as the word itself implies, require monitoring and watching, and we need to add the groups in Borno to our watch lists. Although there has been little reporting on them, and the reports so far have not indicated that the negative morphing is happening or has happened, we cannot let their existence go without paying more attention to what they are doing and how they are doing it to avoid the CAR anti-balaka or Libyan militia situations. Thus, the international community needs to put these new forces or Borno-based vigilante groups on its radar screen to monitor so that they do not become yet another instance of a negative unintended consequence in an already difficult security environment in Northeast Nigeria. 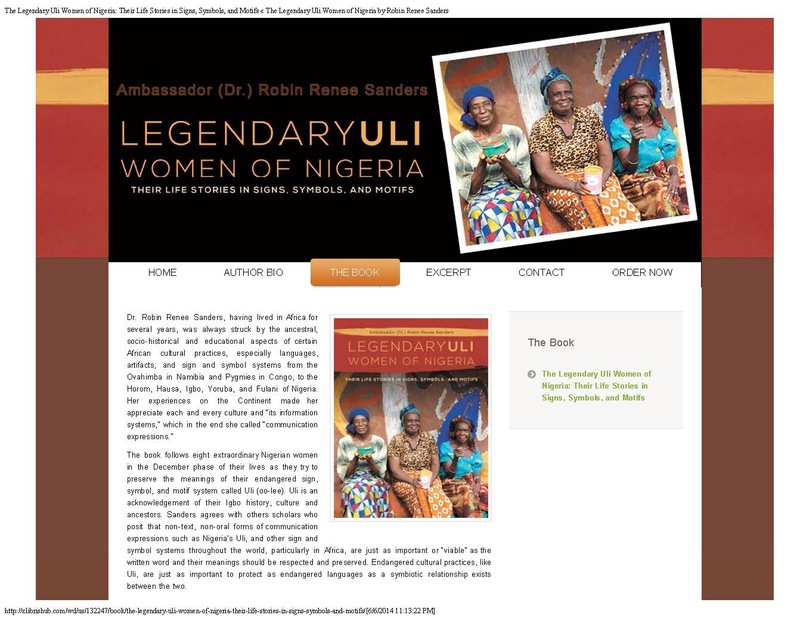 Dr. Sanders' New Book - The Legendary Uli Women of Nigeria -Available Now in Stores & Online! Mr. Chairman, Ranking Member Bass, and Members of the Subcommittee, I want to thank you for inviting me here today to testify before you. I just returned from Nigeria and was in country when the international community became more aware of the horrible kidnapping of 247 girls by Boko Haram on April 14, 2014. 1.) My knowledge of the region, as I have been in every state in Nigeria, including travelling by road from Abuja through what is now Boko Haram’s current expanded territory of operation at least 4 times during my tenure there. 4.) My conversations and first hand observations while on my recent trip to Nigeria. 3.) Address what I am hearing from my contacts on Chibook/Chibok, and concerns there. --Airlift - Airlift is key to troop rotation as I heard reports of PTSD while I was there; it is important because of the distances and tough road travel in the Northeast; and it is important because it will help them react faster to the changing situation on the ground as they try to cover more than 60,000 square miles of territory about the size of Georgia or Wisconsin. -- Improvement in strategic communications and review of existing strategic communications approaches, because what they have now is not working internally or externally with affected communities, particularly with the families of the missing girls. -- I would suggest a liaison committee led by someone respected for their human rights values that engages with the families and keeps them informed. Not someone who is a press spokesperson, but someone who is an advocate, and can avoid the Malaysia flight MH370 fiasco with the families. I lectured as a Visiting Scholar last year at Nigeria’s Defense College and talked about the must-do things the security forces needed to do to build better relations and respond more quickly to the affected communities. I traveled through Kano last month by road on my way to visit an agricultural project I am involved with in the Northwest. There were checkpoints all along the way, anywhere from 30-to-50 kilometers apart. I did not see the ability to communicate between most checkpoints. I understand that in the Northeast this is more acute as distances between some checkpoints are greater, adding to what we already know: That information is not reacted to in timely or effective manner. I am not excusing the poor responses and reaction to date. I am just providing recommendations from a strategic perspective of things that can be and need to be addressed right now as I would hope the assistance packages for Nigeria are including. Nigeria is at the beginning of a long war or long conflict, and they have to realize this. This is no longer a localized conflict or insurgency. There is no easy fix and every attack in response to Boko Haram cannot be viewed a death knell blow to it – a long range security framework to this terrorist threats is what is needed. The security services need to regroup, re-approach, and re-address in order to begin to get off their heels on the defensive and get on an aggressive offense. This has not happened yet, and Boko Haram has not only succeeded in terrorizing 60,000 square miles of territory, but also as evident with the late April 2014 attacks, they have the ability to reach locations just 15 kilometers outside of Abuja, either with sleepers cells or with bombs getting past checkpoints. Right now the security services are out gunned, and out strategically played. One thing I also want to put into the mix on which I am not sure there has been much focus is the language differences. Most of the security forces in the Northeast are Hausa-speaking, while the majority of the village population in Borno are Kanuri speakers. Just like the US military had to ramp up on its Arabic speakers for Iraqi, the Nigerian military will need to increase its Kanuri speakers in order to more effectively engage with the local population there. I mention this as part of the overall issue of addressing and reframing of strategic communication and outreach to the villages. I highlight this to underscore who is going to fight this war, this conflict if it is not the Nigerian security forces, along with assistance from the international community. They are the vanguard of this conflict, so we need to help them pull up their boots straps as an institution to address any challenges they might have to get it together because if the entire security structure becomes demoralized who is going to fight this conflict. There have already reportedly been 1-2 incidents where military units allegedly have shown their frustration by shooting at commanders’ convoys – one report happen while I was still in Nigeria. Nigeria’s neighbors and human intelligence from villagers in Nigeria and neighboring countries will be critical elements of fighting this war, this conflict. There has to be better control of the porous borders and cooperation; P-3 surveillance planes can assist with this, but in the end on-ground human intelligence (or humint) is going to be key. Despite the May 2014 Paris conference with Nigeria and its neighbors, a trust issue remains among them on sharing intelligence. So we need to help build trust among those services as well. Boko Haram has been so brutal that several villages and markets have just disappeared, which means food is becoming scare as planting and commerce has ceased. The international community needs to keep an eye on the food security situation as food shortages could become an issue down the line. The other question I understood the Committee is interested in is why Boko Haram was not named earlier as a Foreign Terrorist Organization (FTO). As I said earlier, Boko Haram has been around since the late 1990s, and was more commonly referred to before (in its earlier form) as the Nigerian Taliban. Prior to the last four years it executed localized sabotage, attacked police stations, and recruited young people into the group, but no kidnapping. Evidence of some Boko Haram contacts with AQIM started to surface about 9 months after (early 2010) the extrajudicial killing of its then-leader Muhammad Yusef and his key lieutenant Al Haji Buji Foi in July 2009; this was shared with the then-government. I was in Nigeria when Yusuf was captured and killed almost before the cameras by the Nigerian Police. From early 2010 until August 2011, almost a full year there was a lull with some small acts, and again localized. The morphing of Boko Haram to using Al-Qaeda or AQIM-like tactics to achieve the goal of establishing an Islamic Extremist Caliphate began really surfacing in mid-2011 with the bombing of the UNHeadquarters in Abuja in August 2011, and since then Boko Haram has continually gotten more expansive in both its reach, and brutality from 2012-2014. 3. Its terrorists activity or terrorism must threaten the security of U.S. nationals or the national security (national defense, foreign relations, or the economic interests) of the United States. The Abuja UN Headquarters bombing showed the: reach; capability, brutality, of Boko Haram and its use of Al-Qaeda inspired tactics; underscoring that all nationals were at risk. The UN HQ is right around the corner from the US Embassy, and when I was there I could see the building from my office window. First my heart goes out to the families and the missing girls wherever they might be as I know they are suffering, scared, and afraid. In Paris Monday there was a Global Conference onWomen, and one of the things said there regarding the Chibook girls is that this tragedy is the epitome in dehumanization that girls do not have the right to control their own fate; their education and who they might choose to marry. Despite reports out of Nigeria, I do not think that most/most of the girls have been in Nigeria for a long time. We have no idea how long the videos being shown were taken. And, these terrorists groups learn from each other, and Boko Haram is nothing but strategic. Therefore, I think it is unlikely that most (maybe not all) the girls have been put into smaller groups and taken across the borders to Chad and Cameroon, or elsewhere, or kept in smaller groups or singular in Nigeria. So, again the human intelligence factor is going to be critical to hopefully finding some of them. I also do not want us to forget that from January-March 2014 young girls were being kidnapped, killed, terrorized and brutalized by Boko Haram. Yesterday, 20 more women were reported kidnapped near Chibook. During January-March 2014, young girls were burned to death in their dorms; others kidnapped, divided up based on their physical maturity level, and those who showed signs of puberty had their throats cut – all of these actions show that Boko Haram’s Shekerau is acting on one of his stated goals that he would: make the mothers and daughters of Nigeria suffer in revenge for the capture of some of Boko Haram’s families members by the Nigerian security forces. 5.) And, I am not making an apples and oranges comparison necessarily, but if the world/international community could mobilize tons of financial, technical, human resources to try to find the missing Malaysia plane MH 370 of 239 people, it can mobilize the same to find the 247 girls no matter in what country they are located. 6.) Things such as mistrust among neighboring countries in sharing intelligence must take a back seat. I do see an array of assistance, but nowhere near the level of mobilization that is probably needed by the entire international community – full time, all the time.